When it comes to the way you could be hurting yourself over the course of your life, you probably think of the way you workout. If you have bad form with weights or even how you jog, you could be doing all kinds of damage to your body. Some of you may have bad habits, like smoking or a bad diet. Whatever the case, the truth is that you could actually be hurting yourself much more than you really know simply by using your computer every day. That’s because our bodies were not meant to sit for as long as we do. It’s bad for our spines and our muscles. We also weren’t meant to pull our arms forward so that we could types and use our mouse for hours at a time. It can actually do serious damage to our shoulders and chest muscles. 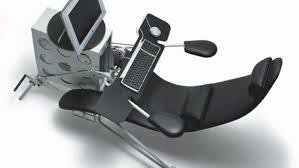 For this reason, we’ve seen greater and greater advances in creating ergonomic workarounds. For example, standing desks are all the rage. If you don’t like standing or find it difficult, ergonomic chairs have become quite popular too. Consumer electronics that are easier on the body will follow suit. Look at keyboards. Many of them wrap around into a half-circle and even curve in such a way that you can easily type without doing the damage we brought up earlier. Whatever consumer electronic we’re talking about, expect the next year to be one where you’ll be more comfortable than ever before when you are using them.